The Schulich School of Medicine & Dentistry CBME website provides information and access to the latest news, presentations and internal and external resources. It will be updated regularly, so be sure to check back to learn more about the progress of CBME. Competency-based medical education is an outcomes-based approach to the design, implementation, assessment and evaluation of a medical education program using an organizing framework of competencies. Historically, residency education has been focused around a time-based learning model, where participating in a particular number of cases, surgeries or years of training would allow a resident to reach an appropriate level of competency to practice independantly. In a CBME system, curriculum is organized around the outcomes expected of a resident, and their advancement is dependant on having achieved those outcomes. It also provides a new approach to teaching and assessment with regular, direct observations to confirm residents are achieving Entrustable Professional Activities (EPAs) in real-life situations. 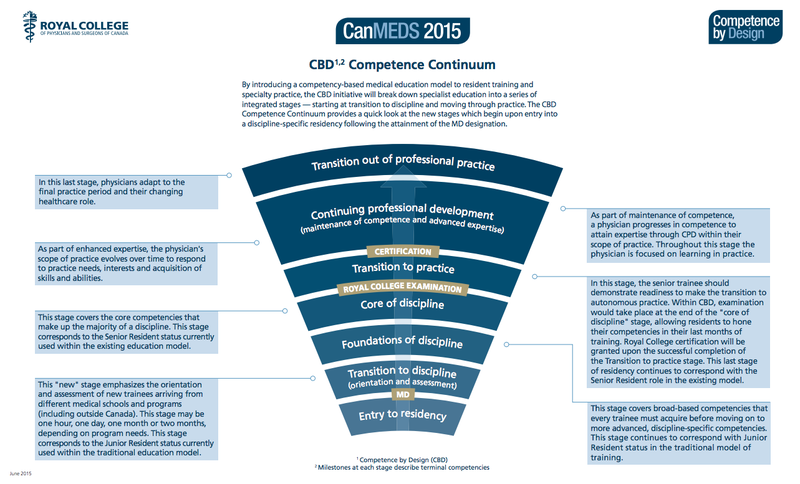 Competency by Design (CBD) is the Royal College’s version of CBME in Canada, using the adapted CanMEDS framework and the competency continuum as a guide. An EPA (Entrustable Professional Activity) is a task in the clinical or work setting that may be delegated to a resident by their supervisor once sufficient competence has been demonstrated. Typically, each EPA integrates multiple milestones. A milestone is an observable marker of an individual’s ability or competence along a developmental continuum, used for planning and teaching. Each surgical specialty has a different time line for the rollout of CBME. On July 1, 2018, Urology and Surgical Foundations will be the first programs to implement CBME with their PGY1 cohort.